Based on author Philip Pullman's novel, 'The Golden Compass' is a fantasy adventure, set in an alternative world where people's souls manifest themselves as animals, talking bears fight wars, and Gyptians and witches coexist. At the center of the story is Lyra (Dakota Blue Richards), a 12-year-old girl who starts out trying to rescue a friend who's been kidnapped by a mysterious organization known as the Gobblers - and winds up on an epic quest to save not only her world, but ours as well. In addition, the film's open-ended finale is a risky move by a studio that thinks audiences will automatically flock to this as they did with Lord of the Rings, but the novels lack either the iconic classic status of Rings or the mass commercialism of Harry Potter, so assuming that a trilogy is a foregone conclusion is a huge risk. 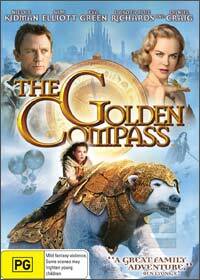 While Golden Compass could do with additional expository elements and a tighter finale, there are many impressive elements to the film. It is certainly captivating and cinematically elegant, with top-notch performances, but whether that's enough to sustain the beginning of a new franchise, is another question.